The 10th promise of Debtors Anonymous says that we will no longer fear the truth; we will move from hiding in denial to living in reality. 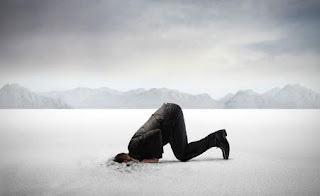 Like an ostrich I buried my head in the sand when it came to debt. I had an addiction with money. If I didn’t have the cash then I used credit cards or wrote checks. I believed that if I had a blank check than I had money. It didn’t matter how much (or how little) money I had in the bank, if I had a blank check then I had a bottomless pit of money. It got to a point that I never had cash because with every payday I had to deposit all the money into my account just to cover checks that were written. I got to the point that I was broke as soon as I got paid. Being broke leads to many creative ways to make money. The easy way is to have garage sales or pawn your possessions, which helps for awhile. Then what? That is where the creativity came into play. I knew some people who did handyman work for cash. Others who did car repairs. Everything was done for cash. And I even knew others who gave sexual favours for money. I won’t say that I did all of these things, but I did most and considered other opportunities. The fact of the matter is when you’re broke you’ll do anything to get a little money. My own ingenuity led me to the idea of a personal ponzy scheme. I had one bank account that had no money in it, with loads of bad checks written on it, so what was the solution? To open a new account at another bank! In my own insanity this idea was perfectly logical. With this new account I could have some cash, keep some in the bank and pay some to the other bank to eventually pay off all the bounced checks. It worked for a very little short time then I started bouncing checks on the new account. So I would run up the amount as high as I could then go back to my original bank. This worked for six months or so. I never really had any money. I just used the banks money to live a lifestyle that was destructive and insane. Until my paycheck couldn’t cover the amount owed to both banks. It was there that reality set in. I knew I was broke but I had no idea how broke. I knew I had bad checks but I had no idea of the amount owed. I knew I owed on a half dozen credit cards but I had no idea of the amount owed. It was a very fearful day when I sat down with a pen and paper and began writing everything down. I started with the accounts I could get on-line, then I started opening letters. Letters that hadn’t been opened in months. A stack at least a foot tall. Every time I picked up a letter, I wanted to drop it and run away. I didn’t want to know the amount I owed because I didn’t have the money to pay anyone. When I was done and figured out the amount, I was shocked. Pleasantly shocked! Yes, I owed a lot of money but it wasn’t as bad as I thought. If I changed my lifestyle and actually worked on this, I could get out of debt. There was no doubt in my mind that I could do this. Fear and denial kept me a prisoner for so long. Not only was I financially broke but I was spiritually broke as well. The reality was that I wasn’t a bad person. I made bad choices but I wasn’t a bad person. The reality was that I could and would get out of debt… one baby step at a time. I needed to remember I didn’t get into debt overnight and I wouldn’t get out of debt overnight.